I’m sitting in the shade of a gardener’s shack with a mad man. At least, that’s what he says he is, though his cloud of white hair, smiley face and cordial manner are reassuringly benign. 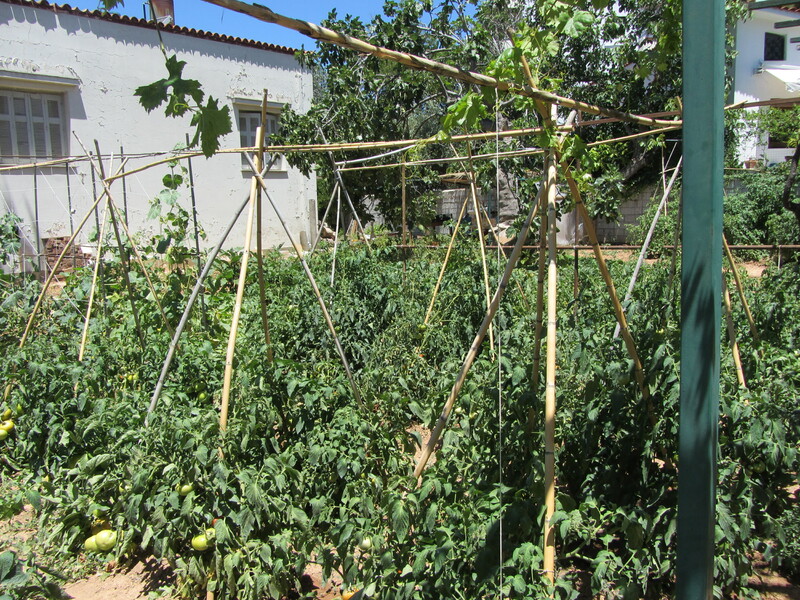 The garden itself — an ebullience of tomatoes, potatoes, zukes, cukes and eggplant – could rival Findhorn. It does look magical, especially since in early May, when I last saw it, the now fruiting plants were only a few inches high. “You’d have to be mad to do what I did here in Kifissia,” says Petros with a huge grin. We’ve already established that he’s been to my country three times, to visit a relative in Pennsylvania; to Hong Kong maybe 50 times on business; that his daughter is an architect, his son tests computer games; and that he has another vegetable garden in Halandri, the suburb where he lives, about 20 minutes closer to Athens. And that, now retired, his passion for growing vegetables keeps growing. Petros loves giving his crops away as much as he loves tending them. And because his garden always produces more than his family can use, he used to distribute its bounty to friends and establishments in his neighborhood. “Besides the kiosk newstand, I’d take vegetables to the kafeneion. One day last year, I happened to go by with some cucumbers – you know how well they go with ouzo – and I offered them to a parea (group of buddies) sitting at a table outside. One of the men got really excited, sat me down and started asking me about my garden. 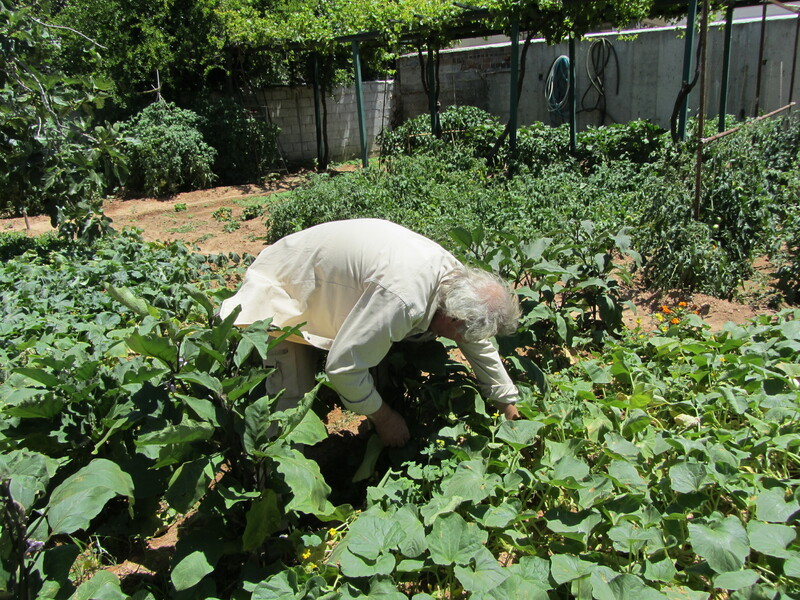 “Several ouzos later we were in his car driving up here to see whether we could make this abandoned property of his into a baxés.” Petros uses the common Turkish word meaning vegetable garden, rather than “perivóli,” and then tells me his surname is Baxevanis or gardener. What could be more perfect! “He’d said there was water, but we had a devil of a time finding it. First we had to empty the plot of all the rubbish, junk, weeds and dead branches. That took 15 truckloads. And when we finally found the borehole, it had run dry from lack of use. Never mind, I said, we’ll use mains water and think about the bills later. Maybe, but he’s also becoming a celebrity. The garden has been written up in the local Kifissia newpaper, the mayor has been to visit, and strangers like me drop in daily, sometimes in groups. Petros is ready with the hospitality. He keeps a bottle of tsípouro on the table along with a plate of sliced tomatoes doused with olive oil. He’s surprised when I decline the hooch. “Eight out of 10 women accept, say they’ll try it,” he says, but does not insist and pours me a tall glass of bubbling mineral water instead. He’s also got charcoal smouldering away in a small barbecue, and would be willing to grill us a few fresh sardines or even cook an omelette if there were time. Behind him is a stack of boxes with green string handles and by his side are a pair filled with cucumbers, tomatoes and peppers. To my right are more boxes, larger ones, containing lemons from his trees in Halandri. But Petros ceases being embarrassed when he talks about his dream. Or should I say dreams? One dream is to work with schools and help them set up vegetable gardens. “Mothers often bring their children with them when they come here. You should see their faces when I show them what a potato plant looks like. They’ve only ever seen them sliced up for fries. They have no idea what goes on underground. 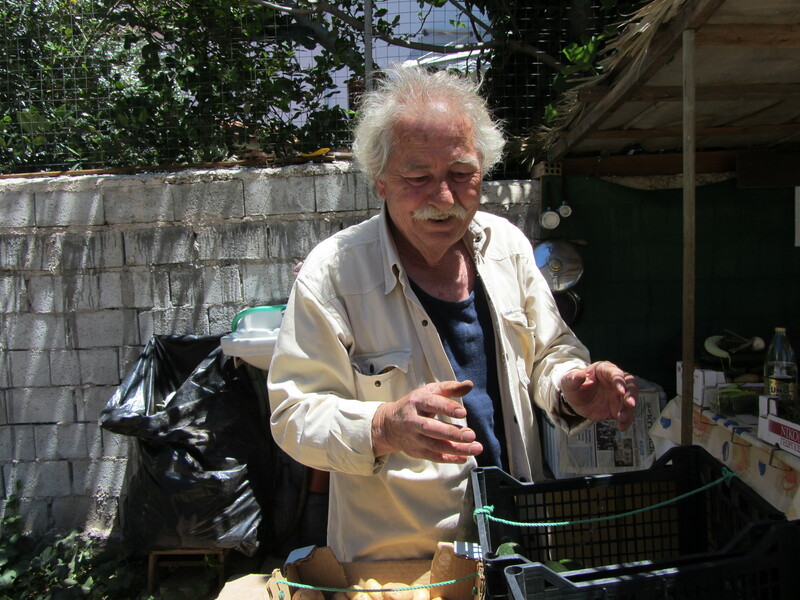 Petros’s other dream is to convince the owners of the big, lawn-covered properties in Kifissia to convert a piece of their thirsty greenery into a vegetable patch. Meanwhile, Petros is planning a party in honor of his name day on June 29th. He’ll be roasting a lamb on the spit and serving tsípouro, sardines and whatever vegetables happen to be ripe. Plus there will be music for dancing. Everyone’s invited. I wish I were going to be around. As I get up to leave, Petros gives me one of those boxes with a green string handle. We walk slowly to the gate, Petros bobbing down to grab a cucumber – three different kinds – some tomatoes, cherry and grapefruit-sized — and offers some peppers and a huge lettuce, which I refuse, embarrassed at so much generosity. “I have another dream, too,” he says. “To grow a tomato that tastes like the ones my mother grew in the early 50s. But for now, I’m happy just watching each plant get a little bigger every day. My wife, Kyria Despina, says I’m neglecting our home garden, but I can’t help myself. I told you, eho mia trella – I’m just a little bit mad. After I wrote this, I looked up baxés in my Greek-English dictionary. Besides “garden,” there is another definition. To say that someone is “baxés” means “his heart is in the right place.” I think this is a better description of Petros. Petros’s garden is located at Ionias 23 in Kifissia, between Harilaou Trikoupi and Kifissias Avenue near the Erythrea stop light, at the level of A/B supermarket. He’s there every day except Sunday between 8 am and 12:30. His home phone is 210 6820601. If you stop by, tell him Diana sent you. Here’s a dish to make when you have plenty of summer vegetables. It’s a Baked Vegetable Casserole from Corfu, where they call it Ftohófago or Poor People’s Food. It’s taken from my first cookbook, Prospero’s Kitchen, (Ionian) Island Cooking of Greece, which has just been republished by IB Tauris/Macmillan. See cover, below. 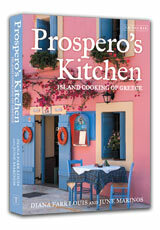 It’s available at Amazon, Eleftheroudakis, Kitchen Arts and Letters, etc. Don’t worry about exact amounts; you don’t even need to have all the ingredients. But do put the vegetables in the order I suggest. It looks fiddly but is very straight forward. Trim the okra and string beans, if using, and thinly slice the zukes. Oil the bottom of a large roasting pan that is at least 4 inches/10 cm deep. Combine the garlic, parsley, salt and pepper. Sprinkle some of this mixture on top of each layer of vegetables in the following order. Strew the bottom with half the onions. Next place the green vegetables – okra, beans, zukes. Add a layer of potatoes and green peppers. Sprinkle this layer with a little olive oil and ¼ cup/60 ml water. Spread the remaining onions on top. Cover with the sliced tomatoes. Sprinkle with salt, pepper, a little sugar (to bring out the flavor of the tomatoes), the breadcrumbs and the rest of the oil. Bake in the preheated oven until the vegetables are all soft and the liquid has been absorbed (add more hot water, if it looks dry). This should take about 1 ½ hours. Cover the pan with foil if the top is getting dark too quickly. If you don’t manage to polish this off in one sitting, it is also just as good the next day at room temperature. What a wonderful portrait, Diana. And what an amazing man. Some people are just gifts to the world, and he is clearly one of them. His garden is so orderly – and so big. I can see why his own family can’t eat everything he produces. I hope his dreams come to fruition – they are lovely, good dreams. Thanks, cara. I’m sure you have such lovely people in Liguria too. Baci. “8 out of 10 women accept” – classic!! What a lovely garden! Not exactly the picture one has of suburban Athens. I love his idea about schools having gardens. My school had several but not food producing. We had a Shakespeare garden where all the plants Shakespeare mentions in his plays were planted; a Pompeian garden (this was where I hung out) which we planted to resemble the internal courtyard of a Pompeian house; and a local wildflower/butterfly garden. 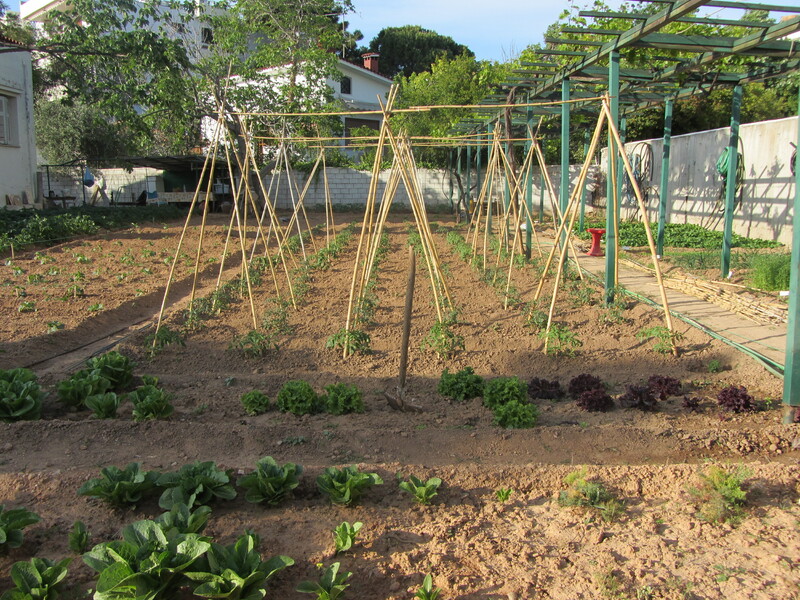 I have no idea why we didn’t have a vegetable garden – makes a lot of sense! My husband complains regularly that Greek schools have an abundance of pavement and no green. Maybe it’s to protect allergic kids, or maybe it’s because space is limited and then want sports facilities, but it would be a great idea to have a garden there and have local residents tend it in the summer when school is out. I’m going to try your recipe, it looks like something I would love! Yes, wasn’t that funny? But maybe you would accept too with such a charming man offering his tsipouro! Petros is very special. I hope to help him spread his message when we go back to Athens. I love your blogs. I look forward to reading wonderful stories about life in Greece. I have always enjoyed my visits to Greece and lately all the press is so negative. I am so happy to have discovered your site, as I read that you have a house in my beloved Andros. I have a house in Pisolimnionas, it was a 25 years dream, I love very very much Andros and I hope I meet you at Katerina’s Joannou cafe in the future. Hi Nonna, Thanks for leaving your note. I haven’t written for a while — been too occupied swimming, picking figs and admiring the view (down to Pisolimiona, actually). Do you go in the winter too? It would be great to meet up at Katerina’s. I hope to be back posting again soon.